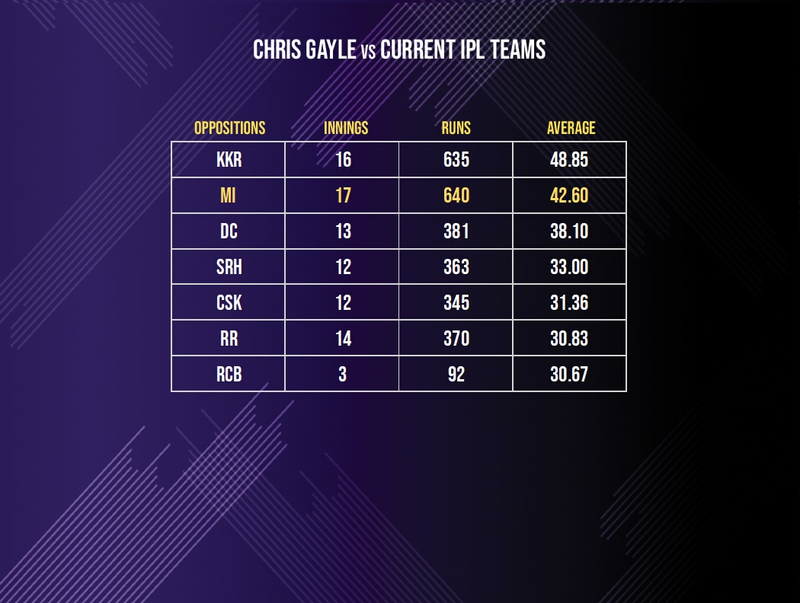 Chris Gayle and KL Rahul were a formidable duo in the 2018 season for Kings XI Punjab with both of them being lethal at the top. The start of the 2019 season, though, has been a bit different for the fearsome opening pair imported from Royal Challengers Bangalore. 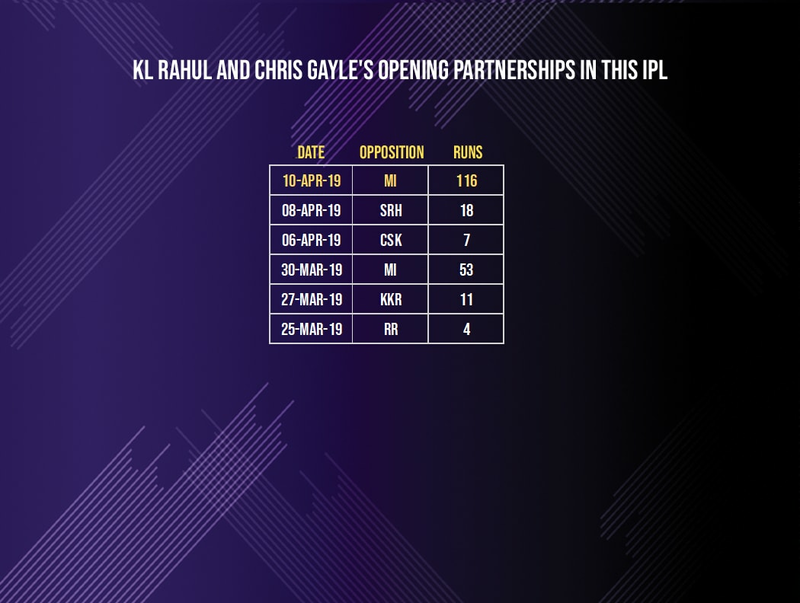 In the five matches in which they opened leading to the game against MI, Rahul and Gayle had aggregated just 93 runs as a pair at an average of 18.6. However, their only half-century stand in the season had come against Mumbai Indians. In the other four matches, Rahul and Gayle stitched together unimpressive stands of 18, 7, 11 and 4. At the Wankhede on the 10th of April, though, the duo struck some serious form and went ballistic again. Rahul played the anchor role as Gayle went on the offensive to peg MI back early. The two put on 116 for the opening wicket, which is the third best opening stand this season (after the two David Warner-Jonny Bairstow stands). Gayle, with his knock of 63 in 36 balls, took his average against MI to 42.6 in 17 innings. His tally of 640 runs against MI is his best against any franchise in the IPL and he averages higher (48.85) only against KKR. Since 2018, the two have opened together for Kings XI four times against MI in the IPL and have registered two fifty stands and one century partnership against their favourite opponents. In 2018, the pair had made 54 and 34 for the opening wicket against MI while in the previous game this season, they put on 53 at Mohali. Gayle took the attack to the MI bowlers which meant Rahul had time to settle in and build his innings – something he has done very effectively and efficiently throughout the season. We have seen a new dimension to his batting this season – his ability to play anchor and accumulate and bat through only to accelerate at the death – this maturity will keep him in good stead in the World Cup in England – he is now almost a certainty in the squad. Contrast this to the Rahul of IPL 2018 where he had been the aggressor-in-chief for Kings XI, even belting a record fastest IPL half-century. He had begun the season with scores of 4 (vs RR) and 1 (vs KKR) before turning it around with an unbeaten 71 against MI in a successful run-chase. He went on to make two more half-centuries – 55 against CSK and an unbeaten against SRH. 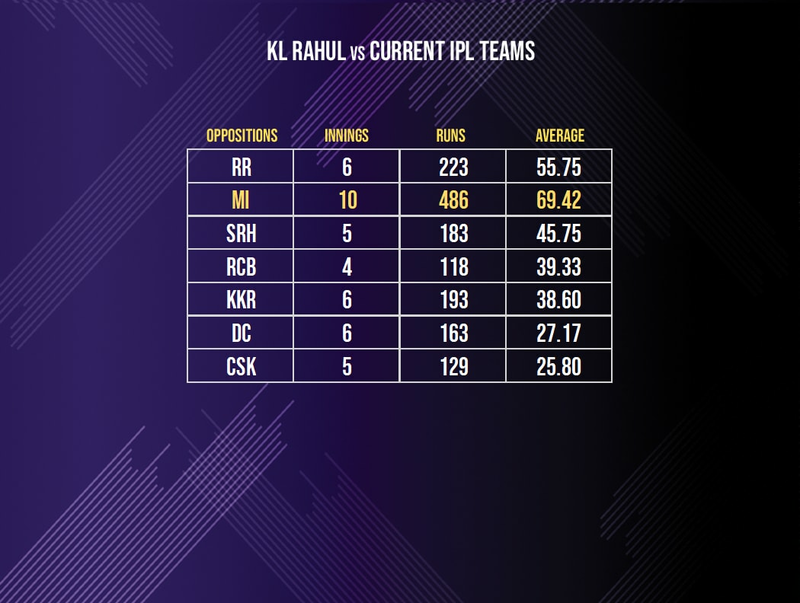 Rahul now averages 69.42 against MI - his best against any franchise. He has amassed 486 runs in 10 matches against them in the IPL – again his highest aggregate against any team.